Moons + Explosives = Lunar Festival! Every year, the druids of Moonglade hold a celebration of their city's great triumph over an ancient evil. During the Lunar Festival, citizens of Azeroth have the opportunity to honor their elders by celebrating their sage wisdom, sharing in magnificent feasts, and (of course) shooting fireworks! February 16 - March 2. Stormwind, Thunder Bluff, Booty Bay, and Moonglade (look for portals in the Vale of Eternal Blossoms). Coins of Ancestry are the currency to purchase festival clothing and other special items. You can collect them by completing quests, including the daily quests that are part of the festival. Wowhead, Icy Veins, Wowpedia, WoW Center (Polish), WoWFan (Czech). 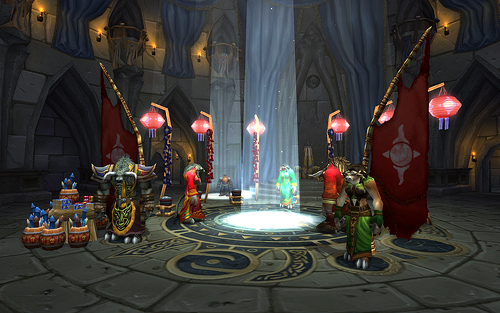 The Lunar Festival is a time of celebration for the peoples of Azeroth. They gather to acknowledge their triumph of ages ago, when an alliance of Azerothian races (Night Elves, Tauren, and the proto-dwarven Earthen) defeated the Burning Legion. The Cenarion Circle has good cause to celebrate, for the Lunar Festival marks the return of many Ancients that fell in battles past: Goldrinn, Malorne, Aviana, and Cenarius himself. At the beginning of each year, elders of generations past manifest around the world to impart their wisdom upon all who listen. Should you encounter these venerable spirits in your travels and take the time to heed their wisdom, they may even pass along tokens of their gratitude — Coins of Ancestry, the lessons of a past age in physical form. An embodiment of strength and fortune, the great wolf Omen fought beside the heroes of the War of the Ancients until he succumbed to demonic magics. Turning against his allies, he raged across Azeroth, leaving death and terror in his wake. Omen was finally defeated in Moonglade, and he now sleeps among the silt of Lake Elune'ara. But each year, at the beginning of the festival, he stirs... Heroes of maximum level must make haste to ease this tormented Ancient’s suffering, in the hopes that perhaps next year he will return with a clearer mind. During the Lunar Festival, you will have the opportunity to honor your elders; in doing so, you’ll also honor their culture and people. Those who show their elders respect will be rewarded with Coins of Ancestry, Lucky Red Envelopes, faction wide reputation, and gold. The innovative and artistic engineers of Undermine have been slaving away since their display of pyrotechnics in July. Their latest and greatest -- not to mention highly dangerous -- creations will be on display in the cities of the world every hour after sunset. Keep your eyes to the skies, and be sure to stick around for the finale! A selection of unique clothing is available to help you join in the festivities. Such outfits have been worn in times past during the Lunar Festival, and each is hand-crafted with only the finest fabrics and other quality components. Many soldiers formerly abroad have come home to engage in the festivities. Share in the merriment and dance with the revelers, or, if you're so inclined, blow a kiss to one that catches your eye. It's all in fun; they appreciate the attention! These sellers will exchange food, festive clothes, pets, and more for Coins of Ancestry! Find out more by clicking on the tabs above. Gather enough Coins of Ancestry and the Cenarion Circle will open their stores of pets, celebratory garb, fireworks, trinkets, and recipes! These beautiful lanterns can be procured from Valadar Starsong in Moonglade for 50 Coins of Ancestry. They will illuminate your path in the dark places of the world. The “Lunar Fireworks” quest reward can be used to teleport to Moonglade while standing in the Greater Moonlight, a large white beam of light located in the main Festival camps. For 5 Coins of Ancestry, you can purchase a Festive Black Pant Suit, a Festive Blue Pant Suit, a Festive Green Dress, a Festive Pink Dress, a Festive Purple Dress, or a Festive Teal Pant Suit. This toy shoots a firework that bursts into the Alliance symbol and will cost you 25 Coins of Ancestry. Note that if you add it to your Toy Box, you will automatically add the Everlasting Horde Firework too! This toy shoots a firework that bursts into the Horde symbol and will cost you 25 Coins of Ancestry. Note that if you add it to your Toy Box, you will automatically add the Everlasting Alliance Firework too! This toy transforms a Solid Stone into an Elune Stone. It is part of the Elune's Blessing quest reward. 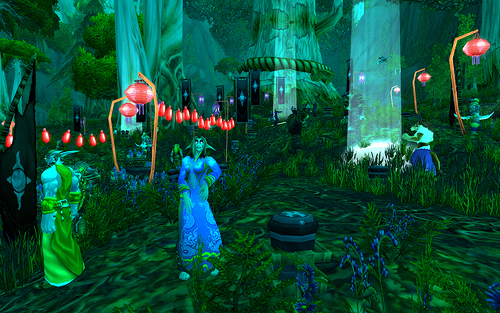 You can purchase Festival Dumplings from Valadar Starsong in Moonglade for 1 Coins of Ancestry. The Lunar Festival currently offers a total of 190 achievement points, split over 16 achievements and 1 meta-achievement. If you complete the 12 Achievements below, your character will gain the title of Elder. 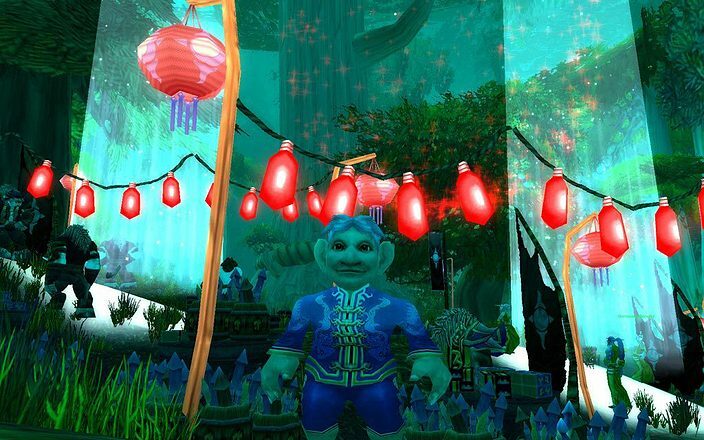 Visit our Lunar Festival gallery for some images from the annual event!